Lorrimer Van Helsing is asked by the British Secret Service to investigate reports of high-ranking bureaucrats being involved in black masses. Van Helsing investigates a mysterious bacteriological research institute where he discovers vampire women chained up in the cellar. The trail leads Van Helsing to reclusive property developer D.D. Denham. Van Helsing discovers that D.D. Denham is in fact Dracula and that Dracula is preparing a virus that will wipe out all life on the planet in order to bring about his own death. With their seventh Dracula film Dracula A.D. 1972 (1972), Hammer Studios had made grudging in-roads to the steps being taken by other vampire films of the era – the acknowledgement that the vampire needed to be taken out of its Victorian milieu and updated to the present. Alas, Dracula A.D. 1972 did a thoroughly miserable job of doing so – in fact, it avoided any of the conceptual challenge involved by keeping Christopher Lee’s Dracula confined to a church for the entire running time. Dracula A.D. 1972 was generally regarded as the worst of the Hammer Dracula’s. Undeterred however, Hammer returned the following year to make a second contemporary Dracula with The Satanic Rites of Dracula. The film’s shooting title Dracula is Dead and Well and Living in London failed to offer much hope, nor did the involvement of the same writing and directing team behind Dracula A.D. 1972. The results finally emerged as The Satanic Rites of Dracula, having undoubtedly been so titled in order to cash in on the sudden popularity of Devil themes brought on by the massive hit of the same year’s The Exorcist (1973). This would also account for the somewhat cursory addition of a Devil worshipping cult sub-plot. (It would have been interesting to see how The Satanic Rites of Dracula would have turned out if this had come after The Omen (1976) and the cycle of End Times prophecy cash-in films that followed that – there are all sorts of intriguing analogies that could be made between Dracula with his biological warfare schemes and the Anti-Christ). The film’s US release was held up until 1978 where it was then retitled Count Dracula and His Vampire Bride, despite the fact that there are not any vampire brides in the film. The Satanic Rites of Dracula is a marginally better film than Dracula A.D. 1972, showing some of the way Hammer could have gone to contemporize Dracula – Dracula is now a Howard Hughes-modeled reclusive millionaire, the shadowy figure behind a sinister corporation. However, all that the Alan Gibson Hammer Dracula films did though was to place Christopher Lee’s cape-clad Dracula in the present, rather than come to terms with the larger conceptual challenge of a contemporary vampire as later films such as Martin (1976) and Near Dark (1987) did with much greater conceptual rigour. In fact, Christopher Lee is not in the film much, showing the series’ increasing failure to find anything worthwhile to do with Dracula once they kept reviving him. Dracula’s scheme to kill off the world with bio-warfare viruses thus earning his own death seems absurdly far-fetched. The bizarre melange of secret agents, government conspiracies, bacteriological warfare, afghan-clad bikers and vampires shows more than anything a desperation for new ideas in the series. The result seems more like a collision between Hammer’s The Devil Rides Out (1968) and an episode of The Avengers (1962-9) than it ever does a Hammer Dracula film. Alan Gibson’s direction is flat and literal and the climax with Dracula impaled on the hawthorn bush is surely the series weakest, especially in comparison to the great climaxes in some of the earlier Terence Fisher entries. The Hammer cycle was about milked out and nearing an end. Christopher Lee saw this – in fact, he was vocal during filming saying that he didn’t like the series anymore. Immediately after The Satanic Rites of Dracula, Christopher Lee hung his cape up, saying no more to Dracula and stating that Hammer would not have enough money or that only Franco Zefferelli could get him to put the fangs back on – although he did go back on his word and appear in the French send-up Dracula – Father and Son (1976). 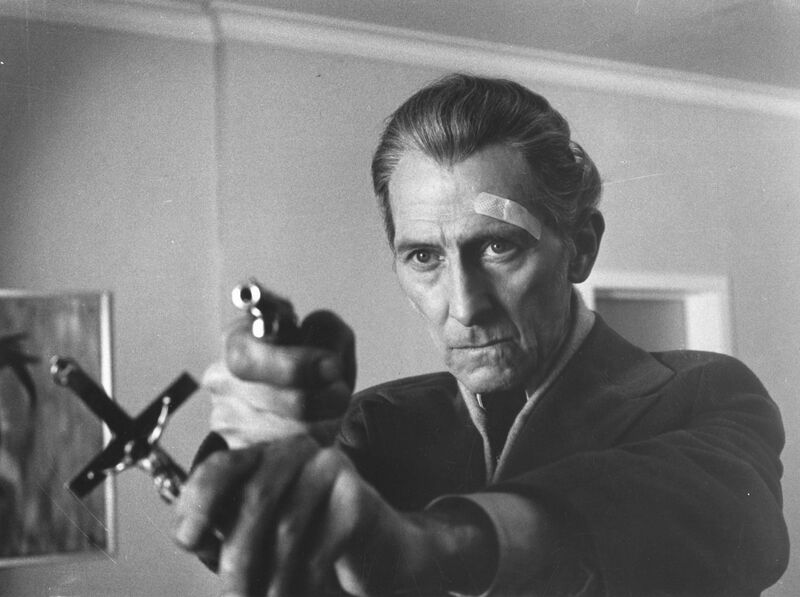 Peter Cushing stayed on for one more film The Legend of the 7 Golden Vampires (1974). There was a plan to make a series of Van Helsing features but after that point Hammer decided that they were milking blood from a stone. Hammer’s other Dracula films are:– Dracula/The Horror of Dracula (1958), The Brides of Dracula (1960), Dracula – Prince of Darkness (1966), Dracula Has Risen from the Grave (1968), Taste the Blood of Dracula (1970), Scars of Dracula (1971), Dracula A.D. 1972 (1972) and The Legend of the 7 Golden Vampires/The Seven Brothers Meet Dracula (1974).